Quality Management for Organizational Excellence 7 Edition This practical, student-focused text shows how to focus all of an organization’s resources on continuous and simultaneous improvement of quality and productivity — thereby continually improving both performance and competitiveness. 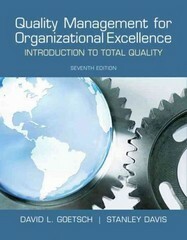 QUALITY MANAGEMENT FOR ORGANIZATIONAL EXCELLENCE: INTRODUCTION TO TOTAL QUALITY, 7/e coherently addresses all elements of quality management, including Lean, Six Sigma, Lean Six Sigma, and many topics that competitive books overlook (e.g., peak performance, partnering, manufacturing networks, culture, and crucial “people” aspects of quality). Direct and straightforward, it links “big picture” theories and principles to detailed real-world strategies and techniques. Throughout, critical thinking activities, discussion assignments, and research links promote deeper thinking and further exploration. This edition adds all-new cases, plus new information on topics ranging from supervision to certification, QFD and SPC to benchmarking and JIT.